We have chosen beautiful Vancouver, B. C. for the 2019 Long Term International Forum. 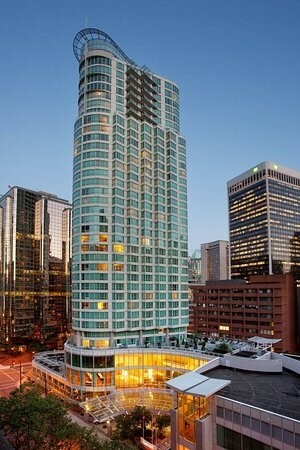 We have booked the Vancouver Marriott Pinnacle Downtown as the venue for our conference. At the Vancouver Marriott Pinnacle Downtown, you'll be centrally located in the city, right in the heart of the city and the action. This 4-star hotel is just (4.2 km) from Granville Island Public Market and (1.8 km) from BC Place Stadium. Gas Town, one of Vancouver’s oldest parts of the city holds some the city’s best eateries. When you think Vancouver think about the water surrounding it. There are whale watches, boat tours, seafood, and beautiful mountains lingering in the background just beyond the city, and much much more . . . to be discovered. The Vancouver Marriot Pinnacle is a four star hotel and we have secured a special hotel rate of $299 plus taxes (Canadian Dollars). At today's exchange rate (11/5/18), $1 Canadian to $.76 U.S. dollars, the room rate comes down to $228 U.S. We know that many attendees might want to come in early or hang around for the weekend so we have arranged the special hotel rates to be available as follows: The rate of $299 is available starting Monday 9/9/2019 and ending 9/14/2019. Yes, you will need your passport to get there so plan ahead, get your passport now . . . last minute passports can be difficult and can be expensive if you use a service expediter. So plan ahead . . . If you need to make reservations by phone be sure to mention the Long Term Care International Forum Conference to get the preferred pricing. Sponsorship: Consider a Corporate Sponsorship! Sponsoring Companies pay just $1150. They get free membership for their company (and any sister companies or subsidiaries), and two free conference attendees. All for one low price. Membership: Consider making your company a member for the low annual cost of $350. The Corporate Membership entitles all employees to reduced conference fees. Attendees from Member Companies pay $450 for each attendee a $200 reduction from the non-member price of $650. Conference Attendance: To sign-up for the 2019 Long Term Care International Forum/Conference as either a member or a non-member go here.